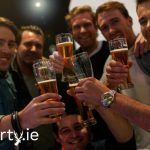 Thinking of Carlingford for your Stag Party location? This fab location is very popular with Stags! 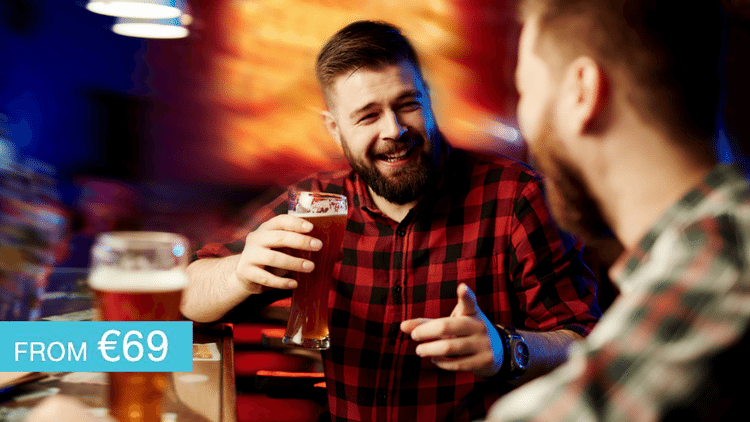 Everything is all within walking distance making it an ideal spot to have your Stag Party in! Accommodation is organised in a very central location. So your Stag Party won’t have to walk far to get to everything! Afternoon of Sports: Watch sports in a top bar on big screens! So no fear of missing the big game lads. Bubble Soccer: The latest craze sweeping across Europe! Playing soccer in a zorb ball on astroturf. Escape Rooms: You have 1 hour to escape a variety of rooms using your wit and brain power. Brilliant craic from start to finish lads! Brewery Tour: Love a good beer? Then enjoy a guided tour on how it’s made and enjoy a few pints at the end too. A great way to kick off the stag party. Axe Throwing: Bring out your inner warrior and try hitting the bulls eye throw your axes at our large specially made targets. Kayaking & Water Trampoline: Use sit on top Kayaks. This makes it easier to get on and off and they are a lot more stable. As well as kayak and paddles we provide wetsuit, helmet & buoyancy aid as part of your kayaking package price. Groups get to finish off their water sports adventure with playtime on our water trampoline and pontoons. High Ropes Challenge:A Challenge like no other, brave the heights and combat your fears. Includes Jacobs ladder, leap of faith and many more team building high rise challenges. Canadian Canoeing: Master your canoeing balance and the basic paddle stroke that will enable you to get out and discover Carlingford Lough’s beautiful harbour and coastline on our beautiful Canadian Canoes. Clay Pigeon Shooting: A brilliant stag party activity to make sure the weekend starts off with a bang. But who will be the sharpshooter in your group? Zorbing: Throw yourself down a hill in a giant inflatable ball. Because you have to do something mad on the stag. Archery Combat: it’s like archery on adrenaline! A high octane, fast paced group activity which is also great fun! Split into teams and do battle like the Hunger Games… but nobody gets hurt here with our rubber pointed arrows! Skypark Aerial Courses: The biggest and most exciting Zipline Aerial Adventure Park. Test yourself on over 30 challenges including cargo nets, skateboards, giant log swings, monkey bars and of course zip wires! With courses ranging from 6ft to 40ft high, there is a course for everyone. Operate the only accessible zip line for wheelchair users in Ireland. SKYPARK caters for all abilities and is perfect for adrenaline junkies or those wanting some family fun and a great day out. You can also enjoy some of the best views in Carlingford from a height. Rock Climbing: Rock Climbing is an activity in which participants climb up, down or across natural rock formations or artificial rock walls. Climb the largest privately owned natural rock climbing wall in Ireland, perfect for wall climbing & abseiling! Ziptopia: Ireland’s longest tree top zipline, make a tree top Zipline tour though the forest canopy on the side of the Slieve Foy Mountain and whiz over our quarry at heights of up to 60ft. An exhilarating Zip Wire experience not to be missed in Ireland’s Ancient East. The course uses a state of the art belay system to ensure your safety at all times as you Zipline from tree to tree. Ziptopia is an AMAZING way to spend a few hours immersed in nature whilst getting great exercise. SUP: Stand Up Paddle boarding (SUP) is fastgrowing water activity and is the perfect sport to explore Carlingford’s beautiful harbour and coastline. If you are into water sports you will love SUP and you get to finish off your session with water trampoline! Laser Combat: Always a popular option for a stag that will push your team to the limit. Abseiling: The perfect option for a group that likes a thrill. Canadian Canoeing: Great for team work as you must work together to paddle your canoes to reach your destination safely. Raft Build Challenge: The ultimate team challenge event. Learn new skills and a variety of knots to keep your raft together. Then your team can build your raft ready for the big finale – the race! Karting: Fuel your need for speed with a high octane day on the Karting track. Laser Combat: Scramble, duck and roll across battlefields, fortresses, tunnels and abandoned churches all while shooting the enemy in the biggest & coolest outdoor purpose-built Laser Tag arena in Ireland! Nine acres of woodland fun in the Ancient East of Ireland in medieval Carlingford. A challenging and fun activity for all ages and abilities. Foot Golf: Footgolf combines the two great sports of football and golf into an even better sport called Footgolf! Its one of the fastest growing sports worldwide and is possibly the best game you will ever play. Players kick a ball from the ‘tee’ to the flag and have to get it into an over-sized flag hole. The person who takes the least kicks to do so wins! The Footgolf course is a 9 hole course with obstacles, trees, bushes and hills to slow your progress. Great fun for all the family and for all abilities. Archery: Take up your bow and arrow, steady your aim and fire. Crystal Maze: Similar to the famous TV Crystal Maze only bigger, more fun and outdoors! Also known as Challenge Island. The perfect team building challenge. 3 hour activity. Frisbee Golf:Frisbee Disc Golf entails throwing your frisbee around a specially built grass course, which similar to golf has ‘tees’ that you start from and ‘holes’ or baskets that you throw to. A 9 hole course is located at Ireland’s biggest Adventure Park SKYPARK and will test your skills much more than just throwing to your friends. With obstacles such as trees, ponds and corners to aim, dodge and spin your way around, everyone has a chance of being the winner! Perfect activity for families, friends and groups of all ages. We have food organised in one of Carlingford’s top bars where your Stag Party will enjoy huge portions. Because we know you’ll need it for the night ahead. Also, all these bars are great criac and have a friendly atmosphere! After your food, we have a free round of shots for your Stag Party in one of Carlingford’s popular bars! You might even meet a hen or two!! So, to finish off this fantastic package, we have entry, a reserved area and a free round of shots in one of Carlingford’s hottest clubs!! From only €69pp, this package is great value! !